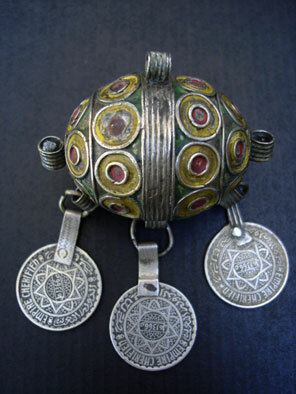 A beautiful vintage enamelled egg pendant from Taroudant with coin pendants at bottom originating from Tiznit. I have seen new enamelled egg pendants being created and it is incredible how many hours and work go into producing a single piece. A beautiful work of art!